The US arms spending is on the slide, while Russia and China are on the rise. The notion is repeated more and more frequently by some media outlets and experts. According to the American Live Wire, «The military might of China and Russia grows; meanwhile America continues to cut defense spending. American Liberals believe that worrying about the rise of Russia and China while America cuts the defense budget is simply fear mongering» (2). This February the US military brass hats met the Senate Armed Forces Committee to discuss the across-the-board cuts after March 1 sounding the alarm about the dangerous impact of the cuts on the combat-readiness of US troops. According to Chairman of the Joint Chiefs of Staff General Martin E. Dempsey, the sequestration will «put the nation at greater risk of coercion». Former Secretary of Defense Leon Panetta said it would «invite aggression»! Incumbent Defense Secretary Chuck Hagel said the reductions would «devastate» the military. General James Amos, Commandant of the Marin Corps, goes even further in warning that a failure to properly resource the military will put the «continued prosperity and security interests» of the United States at risk. Is Russia’s (or China’s) build up justified against the background of US cuts? Adducing facts is the best way to be come to an impartial judgment. A cursory look at what is taking tangible shape right now, this very year, would serve the purpose. On May 1, 2013 an experimental unmanned aircraft developed for the US Air Force has flown at more than five times the speed of sound in a test off California. The test marked the fourth and final flight of an X-51A by the Air Force. This is a breakthrough in scramjet technology that allegedly can be used to deliver strikes around the globe within minutes. As the test went on, the scramjet engine was ignited separating from the booster and accelerating the aircraft to Mach 5.1 (4828 kmh) at 60,000 feet (18,288 meters). Any speed above Mach 5 is generally referred to as «hypersonic». The craft travelled 230 miles in little over six minutes. The flight ended with a planned plunge into the ocean. This was the fourth and last in a series of tests. The X-51A aircraft is known as the Wave Rider because it stays airborne, in part, with lift generated by the shock waves of its own flight. 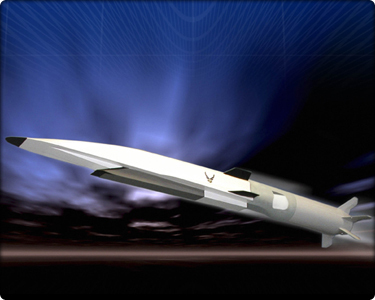 The design includes the «scramjet» engine, which uses the forward motion of the craft to compress air for fuel combustion. The X-51A is unique primarily due to its use of a hydrocarbon fuel in its supersonic combustion ramjet, or Scramjet, propulsion gear. Without any moving parts, hydrocarbon fuel is injected into the scramjet's combustion chamber where it mixes with the air rushing through the chamber and is ignited in a process likened to lighting a match in a hurricane. After being dropped from a B-52 bomber, a solid-rocket booster is used in the initial phase of the plane's flight to accelerate it up to the speed which allows the engine to take over by drawing in air through the craft's forward momentum. As there are no mechanical compressors a scramjet has to be travelling at near-hypersonic speeds to work. The theory and concept is relatively simple but achieving a successful scramjet flight is very technically challenging because of the high speeds and temperatures generated. The Wave Rider is designed to reach speeds of Mach 6 or above, six times the speed of sound and fast enough to cross the Atlantic Ocean and strike a target in Europe in less than an hour. Many details of the program are classified… The objective is to prove the viability of air-breathing, high-speed scramjet propulsion. As a technology demonstration program, there is no immediate successor to the X-51A. However, the Air Force will continue hypersonic research and the successes of the X-51A will make a contribution into the High Speed Strike Weapon program currently in its formation phase. In April 2013 the US Navy announced that it was deploying a laser weapon prototype in the Persian Gulf. For the first time the ships are going to be equipped with a laser attack weapon able to disable patrol boats and blind or destroy surveillance drones as the tests have shown. The Navy calls its new weapon LAWS (which stands for the Laser Weapon System). The prototype shipboard laser will be deployed on a converted amphibious transport and docking ship in the Persian Gulf to counter Iranian fast-attack boats and, possibly, remotely piloted aircraft. The USS Ponce serves as a floating base for military operations and humanitarian assistance in the waters of the Middle East and southwestern Asia. The ship was selected because of its mission to be an enduring presence in the Gulf to counter Iranian maritime threats in the region. The laser will be operational next year. Many of the details about how the laser works remain secret, such as how far its beam can travel, how powerful it is or how much power is used to generate it. But Navy officials have provided a few unclassified details. For example, the laser is designed to be a «plug and play» system that integrates into a ship's existing targeting technologies and power grids. Those factors make it a surprisingly cheap weapon. So far lasers are not effective in bad weather because the beam can be disturbed or scattered by water vapor, as well as by smoke, sand and dust. The weapon cannot attack threats over the horizon and is subject to countermeasures like coating vessels and drones with reflective surfaces. The first prototype is not powerful enough to take on jet fighters or missiles on their approach. The advantages are low cost (less than $1 per sustained pulse) and a limitless supply of ammunition (pulses of high energy) so long as the ship can generate electricity. The beam can reach its target at the speed of light and can track fast-moving targets. One of recent laser system development examples is U.S.-based Raytheon Corp’s laser close-in weapon system (CIWS). First unveiled publically at the Farnborough Airshow in July 2010, the company demonstrates its ability to disable a variety of objects including aircraft, drones, rockets and surface ships, using a 50kW solid-state laser beam. In comparison with the U.S. Navy’s Phalanx radar-controlled CIWS, which uses a multiple-barreled 20mm gun to hit approaching objects. The laser CIWS has the advantage of longer range and, theoretically, unlimited ammunition. Northrop Grumman Corp is also developing the Gamma, a high-energy, solid-state laser (HEL) for the purpose of destroying incoming anti-ship cruise missiles, and is cooperating with the U.S. Air Mobility Command and the Air National Guard on a KC-135 Large Aircraft Infrared Countermeasures-based pod that uses laser beams to disable incoming surface-to-air missiles. The U.S. Navy also has systems under development that are intended to shoot down enemy drones homing in on surface vessels. Similarly, the U.S. Army announced in 2011 that it was doing research on Laser-Induced Plasma Channel (LIPC), which can fire a laser-guided, 50 billion watt «lightning bolt» at a target. The US Navy makes steps into its quest to improve warships’ capabilities to shoot down in-coming missiles, as well as fire projectiles many miles away. Announced last year, the new program is called Hyper Velocity Projectile that will hasten the end of missile dominance. It profiles a warship weapon that can launch projectiles at Mach 10 without explosives. Rail guns consist of two parallel metal rails, between which a projectile held in an armature is loaded, completing a circuit between them. A massive electrical current of the order of one million amperes is applied, creating an electromagnetic field, which in turn produces a force that accelerates the projectile along the rails. A rail gun offers a number of potential advantages over traditional explosive projectile weapons. The accelerating force is applied for the entire time the projectile is between the rails of the launch device, as opposed to explosive forces which have a limited duration. This means much higher velocities can be reached - potentially Mach 10 at sea level, or more than three times the muzzle speed of a rifle bullet. This could result in it having a range 220 miles, which is around ten times further than any other gun. Being non-explosive, Rail gun projectiles rely on their enormous speed to destroy the target and thus reduce the risk of a fire on board of a ship. Comparatively small and lightweight, they can be more readily transported and stored. The kinetic energy they deliver could do as much damage as a cruise missile enabling them to travel clean through a ship. High speeds mean projectiles are much less affected than conventional weapons by factors such as wind, allowing them to retain pinpoint accuracy across a large distance, rather than needing on-board trajectory correction, making them considerably cheaper. The USS Arleigh-Burke (DDG-51) as a likely candidate test platform for sea trials. The next phase is a pulsed power system for launching projectiles in rapid succession. Targeting a firing rate of six to ten 50mm rounds a minute; the naval power system is expected to be operational by 2025. Electromagnetic rail guns, lasers and anti-torpedo torpedoes may be the key technologies necessary to ensure the continued viability of the U.S. Navy’s carrier strike groups when operating against an anti-access/area denial (A2/AD) environment, top former service officials told USNI News. «The real game-changer in all of this, is in my view, the electromagnetic rail gun», said Bob Work, chief executive officer of the Center for a New American Security. According to US Naval Institute (USNI) report (4) using a rail gun for defense would drastically reduce the cost-per-shot for the Navy when defending against mass salvos of guided cruise or ballistic missiles compared with an interceptor missile like a Standard Missile -3. Perhaps more important, a warship can carry vastly more rail gun-rounds than it could ever hope to have missile tubes. The USNI cites retired Adm. Gary Roughead, former Chief of Naval Operations, who said that rail guns are a weapon inventory game-changer because of the projectiles’ size. According to the US Naval Institute’s article Work and Roughead Talk Fleet Protection (May 7, 2013), «The third crucial technology for the Navy is an anti-torpedo torpedo», Work said. «As the carrier battle group pushes into A2/AD networks in the littorals, the threat from submarines increases exponentially». The anti-torpedo torpedoes are smaller than the standard shipboard or helicopter-dropped 12.75-inch torpedoes, being about 9 inches in diameter. Work said that the threat to carrier battle groups is increasing without question — that has been anticipated since the mid-1990s. But if Navy can get electromagnetic rail guns, lasers and anti-torpedo torpedoes into service within the next decade, the carrier battle group will be able to operate deeper inside a contested environment. True, Russia is planning further increases in its military spending, with draft budgets showing a 53% rise in real terms up to 2014. One year ago, President Vladimir Putin openly avowed an intention to radically expand and upgrade the Russian military. Today Russia has embarked on a path of military enhancement. Programs for re-equipping and fundamentally reforming the armed forces are being adopted and implemented. Is this policy consistent with emerging international realities? There is much hue and cry raised over the US military across the board cuts. At that, defense consumes almost 20 percent of the U.S. budget. The country spends more on it than anything else. The United States with its massive spending budget is the principal determinant of the current world trend, and its military expenditure now accounts for just under half of the world total at 41%. As one can see, it fields new game changing weapons, and it does so today. So there is ground to believe the other states have a right for justified concern and adopting military policy to meet the demands of reality.